You may download the sponsorship kit for the Grand Rapids Comic-Con Here. Take advantage of the Grand Rapids Comic-Con by advertising your business at the event through a sponsorship! 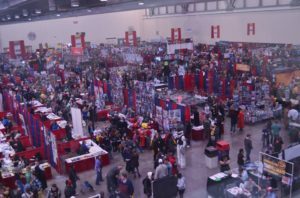 The Grand Rapids Comic-Con is now one of the ten largest annual events hosted in downtown Grand Rapids with over 28,000 people going through the turnstiles for the 2017 event. Literally people of all walks of life attend the Grand Rapids Comic-Con ranging in age from infants to their 90’s, so this is a very diverse, family-friendly event. Our demographic is basically anybody who has seen a superhero or science fiction film, so a sponsorship in the Grand Rapids Comic-Con is an excellent opportunity to reach a diverse customer base!